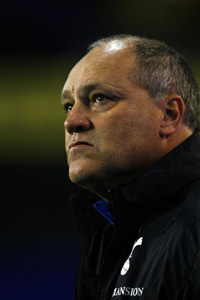 Martin Jol leaves Spurs – did he jump or was he pushed? The seasonâ€™s longest running managerial soap opera is finally over â€“ Martin Jol has quit as Spurs manager after his sideâ€™s 2-1 loss at home against Getafe in the UEFA Cup. Apparently, Jol attended his resignation before the match but failed to go out on a winning note as the Spanish side came from behind courtesy of yet more woeful defending. News of his departure filtered down to the White Hart Lane crowd who chanted, â€œStand up Martin Jol,â€ in appreciation of his three years at the club. There are rumours that a severance package has already been agreed and Sevilleâ€™s Juande Ramos is set to take over, possibly with Gus Poyet as his number two. Spurs fans still chanted Jolâ€™s name after the game and sang in protest against chairman Daniel Levy â€“ who has essentially forced him out by courting other managers. Has Jol left with his dignity or, with one win in ten all season, has he jumped before he was pushed? He was treated disgracefully by the board in August but tactically things haven’t been right and a change is needed. Hopefully Ramos or whoever comes in can get some confidence back into the defence and set about totally rebuilding the midfield – only Lennon should be safe IMO. Good luck BMJ at Ajax, the Dutch national job or wherever. It was an absolutely diabolical decision not to strengthen the midfield in the summer. Why would you need to spend Â£18m on a new striker when you’ve got berbatov keane and defoe, and your midfield is absolutely dreadful. he was clearly pushed, and rightly so. although we saw a little bit of what they could achieve a couple of seasons ago when they were challenging for the champions league spot, they havent quite found that form again and getting into the top four will be a massive task. Good luck to Ramos because what the board is asking for is far greater than what tottenham could ever achieve. anyone else at the game tonight? thought we gave him a good send off as we heard news bit by bit what was going on. surprised he didn’t come out at the end and do a lap of honour or something. did a great job at the club and we will be worse off from this action. I think it would be good to remember that with the continental coaching setup that Spurs have that Jol is not responsible for the signings, this is down to Damian Comolli! Jol has done better than anyone expected 3 years ago when he took over from Jacques Santini.